You’ve seen the epic surf on Endless Summer and Big Wednesday. Now it’s your turn! 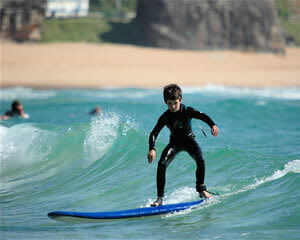 Start small and feel the freedom and power as you ride down the glass like face of the perfect wave. 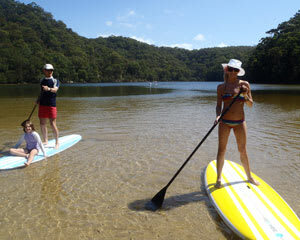 Surfing lessons are for beginners right through to advanced surfers. Complete beginners can experience the rush of catching their first wave. Book Now & You Save! 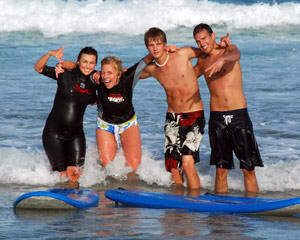 All surfing lessons - beginners through to pro - progress through the skills of surfing according to the students' abilities and previous experience. The instructors will start by checking the surf conditions with you and lead into the warm up to prepare your body for a session of surfing fun, entertainment and improvement. Beginners sessions will cover the basics of riding a surfboard and how to catch a wave, surf awareness and ocean conditions (rips, currents, tides) all whilst you are on the beach. The focus is to introduce you as a beginner surfer to the pure thrill and addiction of surfing a great wave, but also to educate you on the dangers of the ocean and the importance of fitness and safety. 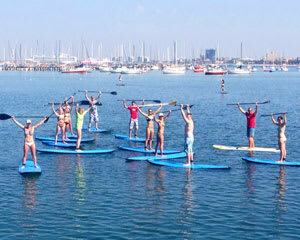 Techniques you will learn include: How to ride a surfboard, surf awareness, surf safety, warm-up and stretches. 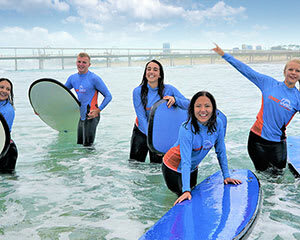 Book a surfing lesson, Or buy a learn to surf voucher today. Surfing was a central part of ancient Polynesian culture, and the chief was the most skilled wave rider in the community with the best board made from the best tree. Moreover, the ruling class had the best beaches and the best boards, and commoners were not allowed on the same beaches, but they could gain prestige by their ability to ride the surf on their extremely heavy boards. Surfing permeated ancient Polynesian society, including religion and myth, and Polynesian chiefs would demonstrate and confirm their authority by the skills they displayed in the surf. Australia's love of surfing was born when, in 1915, Hawaiian surfer Duke Kahanamoku rode a surfboard for the first time in Australia at Harbord, on Sydney’s northern beaches. A statue of the Duke on the northern headland commemorates the event. the surfer off of the bottom and draw him or her "over the falls." 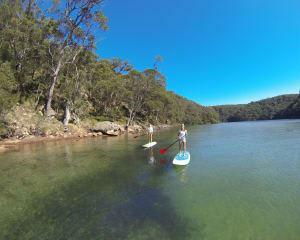 • Hang Heels - Facing backwards and putting the surfers' heels over the edge of a longboard. • Re-entry - hitting the lip vertically and re-rentering the wave in quick succession. • Air/Aerial - riding the board briefly into the air above the wave, landing back upon the wave, and continuing to ride. • Wipe Out- Falling off your surfboard while riding a wave. Accident while involved with surfing.